WASHINGTON — President Donald Trump fulfilled a major campaign promise Tuesday, proposing a $4.1 trillion federal budget that would upend Washington. But he drew rebukes, even from some Republican allies, for the plan’s jarring, politically unrealistic cuts to the social safety net for the poor and a broad swath of other domestic programs. 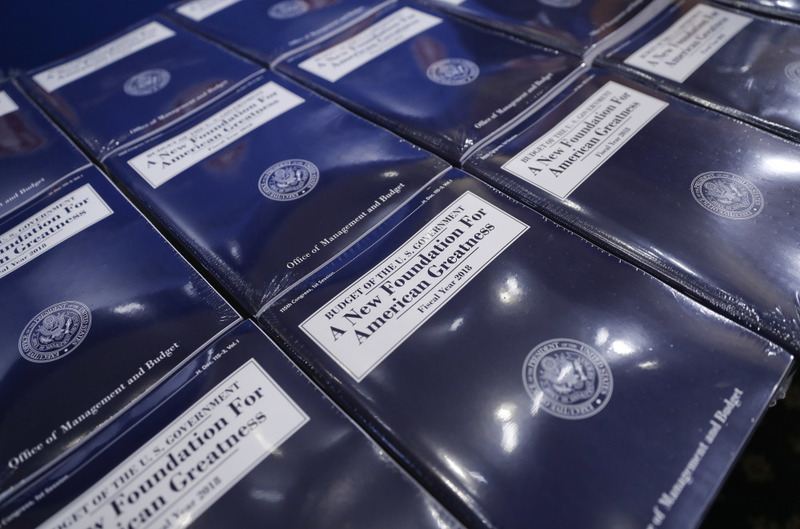 The budget, Trump’s first as president, combines his spending plan for the fiscal year that starts Oct. 1 with a promise to balance government books after a decade, relying on aggressive cuts, a surge in economic growth – and a $2 trillion-plus accounting gimmick. 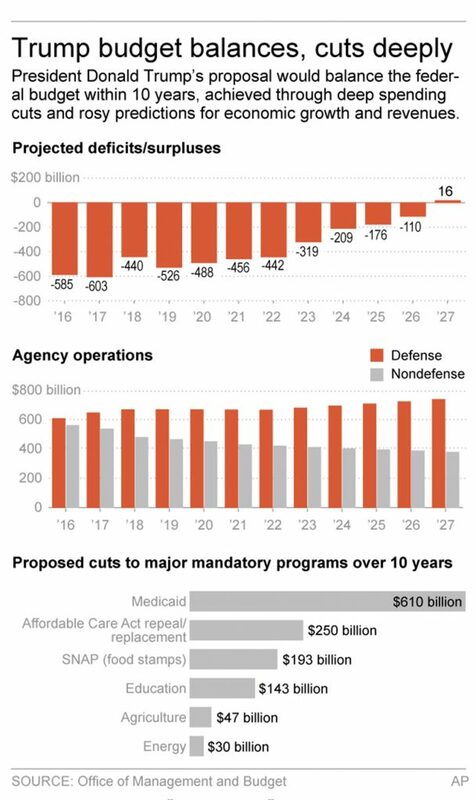 The plan is laced with $3.6 trillion in cuts to domestic agencies, food stamps, Medicaid, highway funding, crop insurance and medical research, among others. Many of the voters who propelled Trump into the presidency in November would get significantly less from the federal government. At the same time, the blueprint would boost spending for the military by tens of billions and calls for $1.6 billion for a border wall with Mexico that Trump repeatedly promised voters the U.S. neighbor would finance. Mexico emphatically rejects that notion. Food stamp cuts would drive millions from the program, while a wave of Medicaid cuts – on top of more than $800 billion in the House-passed health care bill – could deny nursing home care to millions of elderly poor people. It would also force some people on Social Security’s disability program back into the workforce. The budget does feature a handful of domestic initiatives, including a six-week paid parental leave program, championed by Trump’s daughter Ivanka, that would be designed and financed by the states through cuts to unemployment insurance. Some $200 billion in federal infrastructure investments are promised to leverage another $800 billion in private investment, though the idea has yet to get much traction. During the campaign, Trump attacked the weak economic growth of the Obama years, and pledged that his economic program would boost growth from the lackluster 2 percent rates seen since recovery began in mid-2009. Trump’s new budget assumes sustained growth above 3 percent, sharply higher than the expectations of most private economists. Without more than $2 trillion in such “economic feedback” over the coming decade, the nation’s budget would never reach balance and would run a deficit of almost $500 billion. Trump’s balanced-budget goal depends not only on the growth projections but also a variety of accounting gimmicks, including an almost $600 billion peace dividend from winding down overseas military operations and “double counting” $2.1 trillion in revenue from economic growth – using it to both pay for tax cuts and bring down the deficit.